I loved Elyse’s Whiteout, so looked forward to this. Its a very different style of book IMO, but once more Elyse lets me wallow in the angsty bit, really stretches it out. So many otherwise perfect for me stories just skip that part, breakup on page 278, make up by 280….here it covers a decent span of time both in book pages and weeks/months. When we meet Jeremy he appears almost mechanical, very goal focused and nothing detracts him. He’s kind of isolated with only diver Val and trainer Andrey as – well, not freinds even Val, but contacts? acquaintances? He’s been training and diving since he was seven, much to the disgust of his father and brothers. Fag sport is what they call it, they’re the type of stereotypical rednecks that pride themselves ( somewhat ironically!) as Men’s men. You know, the tough sort, the Manly type….sadly, there’s lots like him. Jeremy has been trying to make his family proud for years, but so far they still deride his sport. Olympic cold will do it he thinks, and that’s his goal. So when he finds out Andrey has taken on another pupil he’s not happy. Andrey came out of retirement to train him and he’s been his only pupil for a long time. Now he has to share with Brandon and he makes it clear he isn’t happy. He thinks Brandon is a waste of time, he’s out for the fun of diving, only been doing it for two years and has so much raw talent that Jeremy is annoyed he won’t take it seriously. Not only that but he’s Gay and proud of it. Cue much friction. Brandon comes from a wealthy background but when he came out to his parents at 18 he was thrown out. He knew it would happen, made a few plans and has been alone ever since. He’s had lots of freinds, is still close to his ex, and is just going along with the flow, delighted to have got a scholarship and training for his diving. He does it for fun though, looks at Jeremy’s single minded focus and thinks there’s more to life that being like that, giving up everything for one goal. Jeremy intrigues him though, he’s politely rude, makes it clear he thinks Andrey shouldn’t be training him, and Brandon just wants to find a way to crack through the disdain he shows for him. And then number three comes in, Val, long time competitor who’s met Jeremy so many times they’re kind of friends, well as close as he will allow himself anyway. Friends divert his focus and he won’t allow that. Val has pushy parents, thwarted from their own ambitions they’re determined to push her to the Olympics. 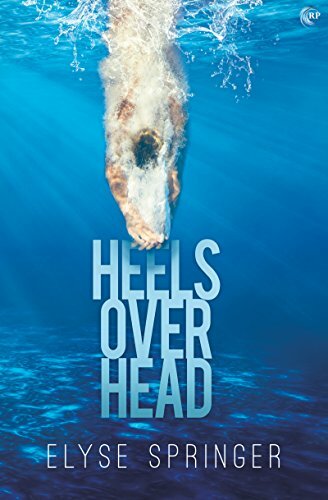 As a child she followed without question, as an adult now she’s feeling she wants to find her own way in the world and that may not be through competitive diving. So three very diverse characters. Val makes friends with Brandon pretty quickly, he’s a likable guy and she doesn’t have Jeremy’s intensity about focus and friendships. She needs freinds to support her when her mother is around! Brandon is attracted to Jeremy from the off, but soon realises Jeremy may be giving off signs that he’s attracted by Brandon, but is not admitting that even to himself. He’s what Brandon and his friend call a skeleton, someone so deep in the closet they don’t acknowledge even to themsleves their feelings. That way disaster lies from Brandon, and yet he can’t seem to keep away, can’t stop trying to get Jeremy’s attention. I love this kind of read, where people are so opposite, so different you think No Way will they make it together, and then authors prove that totally wrong. Its no quick fix either, but slowly, so very slowly Jeremy comes round to Brandon, to the point where they’re lovers. And then bam…it’s all off. Oh I love that part in a story, where just as they look set for a HEA after lots of struggle and work it all goes wrong. I don’t know the world of swimming at all but here it was so well explained I could follow along, get involved in the way they wanted to win, understand the things they were up against. There’s a lot of side content here, that adds so much to the story, things we need to know to really understand the characters and that worked really well for me. At the beginning I didn’t think I could ever really like Jeremy, he seemed so cold but as I got to know him I so felt for him, for what he’d tried to do, for the things he’d given up to try to get his families approval. Brandon I loved from day one, and Val, well sadly there’s so many like her, who have their own ambitions thwarted by parents who want to push them in another direction. doesn’t everyone deserve to make their own choices, do what they know will make them happy?